Scholars, critics, reformers, politicians, and activists have for years asked why Americans are so uninvolved in the political process. Minority underrepresentation, the marginalization of progressive voices, the exclusion of the poor-these and other serious problems appear everywhere, from the pages of national newspapers to MTV. 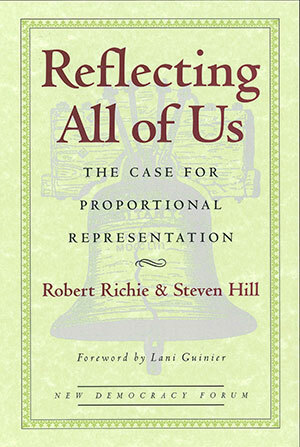 Robert Richie and Steven Hill offer a powerful solution, one currently in practice in many parts of the world, including places in the U.S.: proportional representation. They demonstrate that unlike the winner-takes-all system, which always leaves the losers completely unrepresented, proportional representation gives all points of view a political voice; it works by giving citizens multiple votes or the right to vote for more than one candidate, or by giving political parties power according to percentages of votes received. Esteemed thinkers-Cynthia McKinney, John Ferejohn, E. Joshua Rosenkrantz, Gary W. Cox, Daniel Cantor, Ross Mirkarimi, Anthony Thig penn, and Pamela S. Karlan-respond in essays discussing the forms proportional representation could take to operate best in the U.S. Their contributions underscore the concept at the heart of this book: the more people invested in the political process, the more democratic-and reflective of all of us-our system becomes. A series of short paperback originals exploring creative solutions to our most urgent national concerns. The series editors (for Boston Review), Joshua Cohen and Joel Rogers, aim to foster politically engaged, intellectually honest, and morally serious debate about fundamental issues-both on and off the agenda of conventional politics.